In February 2014 we presented Sue Callum – Senior Sister at St James’s Hospital Breast Care Unit with £10,000. The money will be spent on divider screens for the waiting area and refurbishment of four small rooms where patients can discuss their diagnosis and treatment with a nurse in a less clinical environment. This department needs lots of things like TV screens to display waiting times and useful information for patients. Electric examination beds so that patients can be raised, lowered and positioned comfortably without being shaken about whilst at their most vulnerable. Benches for the corridor. Computer terminals for patients to browse related websites. We will continue to raise money to improve the treatment and care of patients and hopefully tick some of these items off their list! 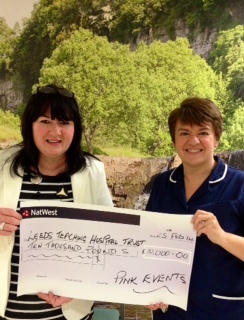 Continuing the relationship with the Leeds Breast Clinic at the LGI the committee have been able to contribute towards the costs of purchasing specialist x-ray equipment to be used in the operating theatres. When a tumor is removed in a lumpectomy, the most common form of breast cancer surgery, the surgeon needs to remove the tumor as well as some of the surrounding tissue. To ensure an acceptable degree of surrounding tissue the tumor is x-rayed to view this ‘clear margin’. Normally the sample has to be rushed to the x-ray department where the technician has to break off and produce the films for the surgeon. These films are then viewed by the surgeon to determine if the work is complete. If there is any doubt and a second x-ray is required the patient is kept under anaesthesia for a longer period of time. The specialist x-ray equipment is intended to be used directly in the operating theatre where the surgeon can immediately view the results and if required take a second x-ray without the delays that have been previously described. This will mean that the patient will have less time under anaesthetic and the surgeon will be able to have sure knowledge that the proceedure is completed. The equipment outlined is expected to cost in the region of £50,000 and the contribution of £10,000 will go a long way to making this a reality. present Mr Phil Turton FRCSEd, FRCS(gen SURG), MD(Hons) with a cheque for £5,050. 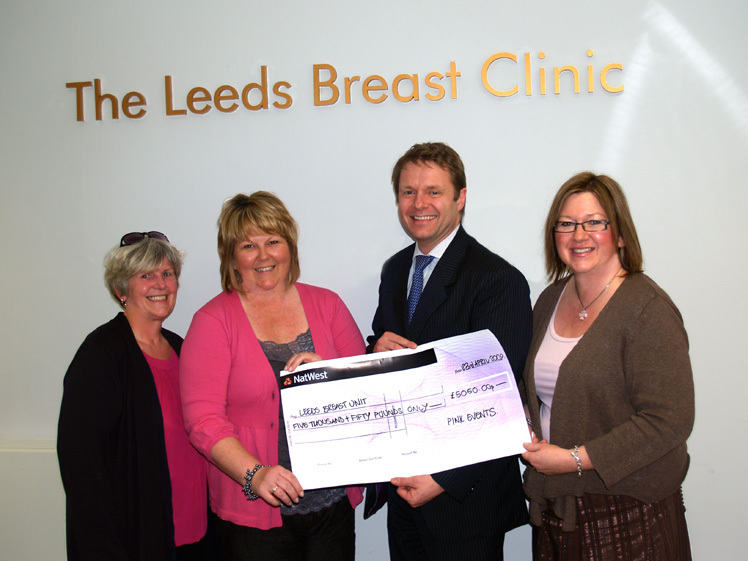 The donation was raised to enable Mr Turton to purchase the Coleman Fat Transfer System for the Leeds Breast Clinic where he is the Consultant Breast and Reconstructive Breast Surgeon for the Leeds Teaching Hospitals Trust. The Coleman Fat Transfer System will be the first in this region and provide the Breast Clinic with a method of assisting women who have had a mastectomy as part of treatment for Breast Cancer. Mr. Turton has trained in the use of the Coleman system in Glasgow and is now looking forward to being able to offer this innovative treatment to the women of the region. Following a mastectomy reconstructive surgery is sometime an option taken by women. One method is to take muscle from the back to use as a natural reconstructive material, however, sometimes there is not enough material to give a satisfactory result. This is where the fat transfer system comes in. Fat cells are removed from the patient by means of gentle liposuction in order not to damage them. These cells are then separated by means of a centrifuge and the ‘good’ fat cells are used to be injected through micro-cannulas. Because the fat cells are a natural product of the body there is no chance of rejection and the results achieved by this system have been declared to be truly amazing. The system was pioneered by Dr. Sydney R. Coleman working in New York between 1995 and 2000. Since then the system has been growing in favour with the medical fraternity and we are pleased to be able to provide the funding for this equipment. Mr. Turton is now looking forward to being able to train his team in the use of this equipment and expand the services of the Leeds Breast Clinic. It is anticipated that the first patients to benefit from this new equipment will be seen in June 2009.